[dropcap letter=”G”]listening vistas of cerulean and white. 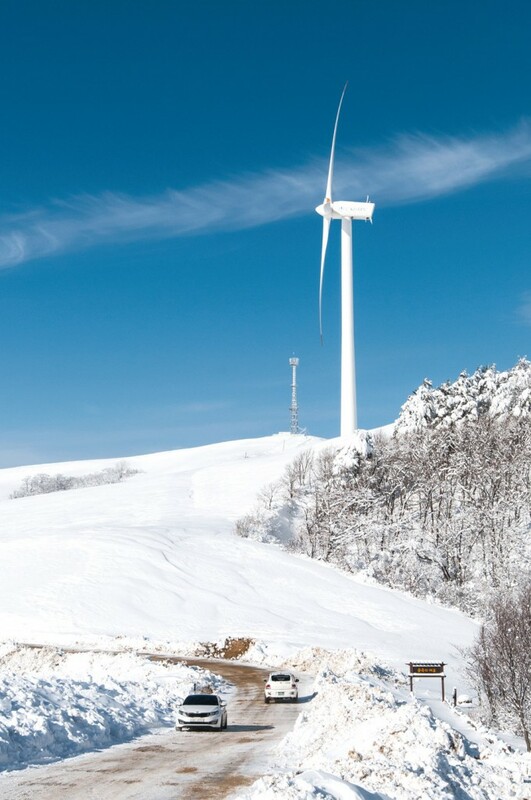 That’s what you’ll see when you visit the Daegwallyeong Pass in the wintertime. The heart of Korea’s “snow country,” the high passageway through Korea’s soaring Taebaeksan Range gets more flurries than anywhere else in Korea, resulting in an expansive highland landscape where white, snow-covered hills and fields roll on forever beneath a deep blue sky. The magnitude of it all can be very awe-inspiring. 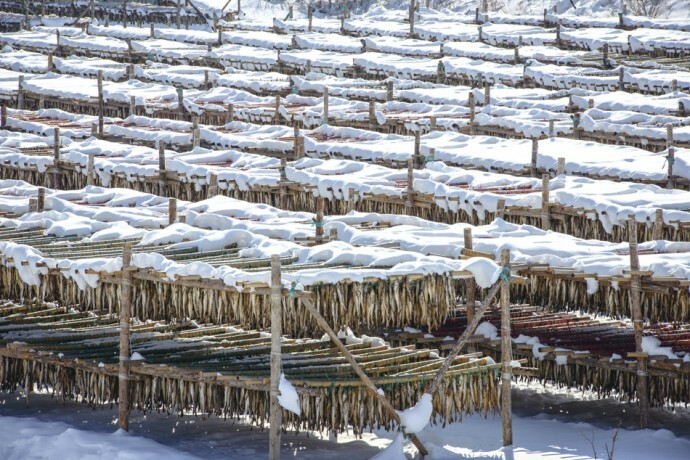 The unique highland topography of the region has combined with Korea’s modern history to produce a unique local culture, exemplified by the racks of freeze-dried fish you’ll see throughout the pass, a specialty brought here after the Korean War by resettled refugees from North Korea. 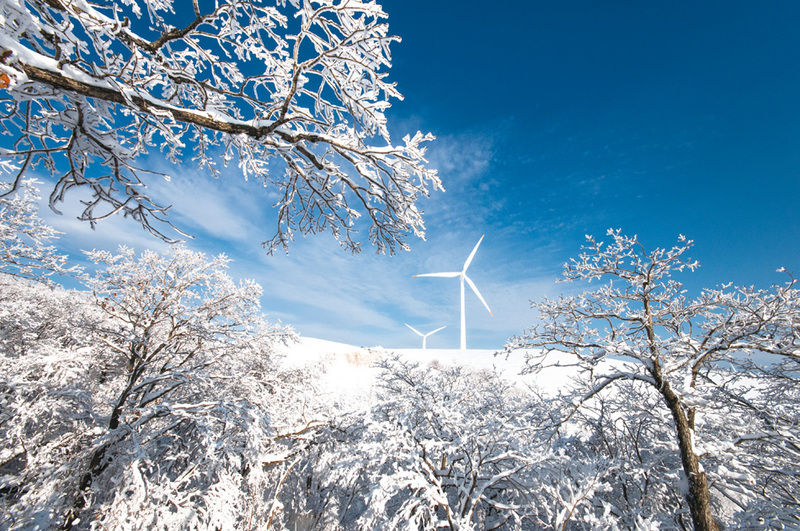 The highland plateau is also one of the few places in the country where you’ll find large-scale ranches, including the popular Daegwallyeong Sheep Farm and the vast Eco Green Campus, a cattle ranch that doubles as one of Korea’s largest wind farms. Some of Korea’s most popular ski resorts are located nearby as well. 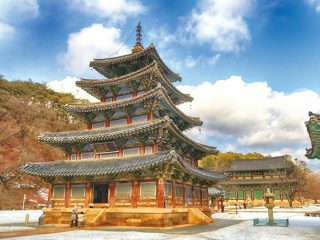 Making up the boundary between the coastal city of Gangneung and the mountain town of PyeongChang, the Daegwallyeong Pass has been one of Korea’s most important roads for centuries, linking the lowland regions in the west – including Seoul – with the East Sea coast. According to one theory, its name means “Pass That Keeps Rolling On,” and to be sure, there are said to be 99 bends in the windy pass road. In recent years, the Daegwallyeong stretch of the Yeongdong Expressway, which connects Incheon and Seoul with Gangneung, has gained a reputation for impassibility in winter due to frequent blizzards: Between November 2013 and April 2014, the area had snow fall on 46 different days, depositing a grand total of 378 cm of snow. This year, the authorities have made extra preparations to keep the pass open, and at any rate, getting around is still considerably easier than it was in the past, when you needed snow shoes or an ox-driven sled to move about. The cold, snowy winter weather has greatly shaped the lifestyles of the people who live here. Soon after the Korean War, many families from the Hamgyeong-do region of what is now North Korea settled in the pass, where the austere, windy and mountainous terrain was similar to that of the homes they left behind. Keen to survive the coming storm, they brought with them a regional method of preparing pollack, and in December, locals set up wooden racks from which hundreds of pollack are hung. With temperatures plunging to minus 10 at night, the fish are continuously frozen and thawed. This is done consistently until April, by which time the dried flesh turns a beautiful golden color. The final product, called hwangtae, is eaten grilled or used in soups and stews. The racks that are essential to this process, called hwangtae deokjang, can be found throughout the region, but are especially numerous at Hwangtae Deokjang Maeul, a village just south of “downtown” Hoenggye-ri. In 1972, Korean instant noodle maker Samyang acquired vast tracks of highland around Daegwallyeong and turned it into pasture for cattle to supply milk and meat. Completed in 1985, the Daegwallyeong Samyang Ranch (T. 033-335-5044/5), or Eco Green Campus as it is now called, is the largest ranch in East Asia, occupying land some 7.5 times the size of Seoul’s Yeouido, all of it between 850 and 1,400 meters above sea level. On this rolling landscape of hills, punctuated by rows of giant wind turbines built a decade ago, live 900 cows as well as sheep, rabbits and ostriches. There are roads – used by shuttle buses – and walking paths leading from where the bus drops you off to the East Sea Observatory, a viewing platform where, from 1,140 meters, you can take in views of the ocean. It takes about 1.5 hours to walk the four-kilometer stretch, though, so be sure to dress appropriately. The ranch is very scenic, both in its summer greens and winter whites, and is frequently used as a filming location for films, dramas and commercials. 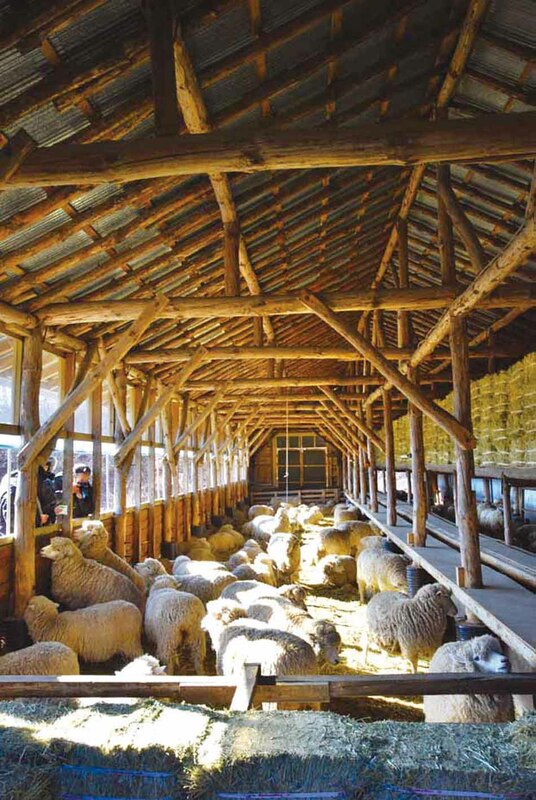 The sheep prefer to stay inside during the winter months, but you can still feed them if you like – the KRW 4,000 admission fee includes the opportunity to feed the downy beasts some hay in the barn. If your interest in sheep is more culinary, you can buy lamb kabobs at the entrance of the ranch. At some 1,157 meters in height, the Seonjaryeong Ridge forms the boundary between PyeongChang to the west and Gangneung to the east. The hike to the ridgeline from Daegwallyeong Rest Stop takes you through a surreal winter landscape of snow-encrusted trees and sweeping vistas of the Taebaeksan Range, Korea’s mountainous spine. It’s an easy hike, too – you start at 800 meters, so it’s only a 300-meter ascent – but be sure to wear crampons on your boots. The hike ends at Eco Green Campus. Registered as a UNESCO Masterpiece of the Oral and Intangible Heritage of Humanity, the Gangneung Danoje is a large-scale shamanist celebration held on the fifth day of the fifth lunar month to honor the mountain gods who reside in the Daegwallyeong and pray for peace and prosperity. The colorful celebration takes place throughout Daegwallyeong and the city of Gangneung. One month prior to the main celebration, however, major shamanist rites are held on the 15th day of the fourth lunar month at the Guksaseonghwadang Shrine, an altar located on the path to the Seonjaryeong Ridge (see “Off the Beaten Path”). These rites include sacrifices to the gods, shamanist music and dance and a procession in which the gods are brought down from the mountain and enshrined in downtown Gangneung. One local specialty is spicy pan-fried squid and pork, or osam bulgogi. Many restaurants in downtown Hoenggye-ri sell this dish, but Napjak Sikdang (T. 033-335-5477) has been doing it and doing it well for 40 years. Hoenggye-ri has several small hotels and motels, including the pleasant Dae Gwan Ryung Sanbang (T. 033-335-5581). 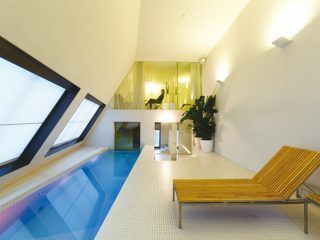 Another option is to make use of one of the several rental houses, or minbak, as they are called in Korean. Some ones to check out are Wildfloaroma (T.033-335-6873), Jajaknamu Pension (T. 033-335-3691) and Woorimaul Pension (T. 033-336-4580). Of course, if you’ve got the money to burn, the nearby ski resorts have luxury accommodations, too. The Alpensia Resort (T. 033-339-0000) has branches of the Holiday Inn and the InterContinental, while Yongpyong Resort (T. 033-335-5757) has a wide range of lodging options, including a high-end hotel, a youth hostel and luxury villas. Buses to Hoenggye-ri run from Seoul’s Dong Seoul Bus Terminal (Travel time: 2 hours, 30 minutes). From downtown Hoenggye-ri, you’ll want to take a taxi to individual destinations.